A TED Fellow posted on an anonymous confession board: “I only have $5 in my bank account til Sep 12. Not sure how I’ll get by either.” This is what happened. 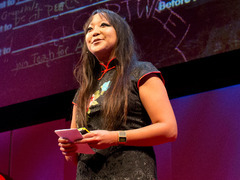 At the recent TED Fellows Retreat in Whistler, Canada, artist Candy Chang set up an interactive art piece called Confessions that invited the 185 Fellows at the event to share. The installation asked each Fellow to write down a confession on a slip of paper and pin it up on a bulletin board, creating a public wall of admissions and fears. Among the posts on the wall was an admission of financial insecurity — to which Fellows responded with a display of generosity that Chang says “moved me to tears.” Below, we asked the Fellow who wrote this confession to tell the story — anonymously, of course. At the Fellows Retreat, I was one of the first to post a confession on the bulletin board display. I absolutely love Candy Chang’s work, and the way it inspires communal participation, so I wanted to be part of it. My first year as a TED Fellow was full of sins … of omission. To people I met, I admitted my fear that I didn’t belong, but not my true fear about being unworthy of the program altogether. How did I get chosen among these amazing people? I felt conflicted about being included, and the struggle in me alienated others. But this time, I came to the Fellows Retreat in Whistler with none of that baggage. All my demons were worked out after being humbled by much more severe life lessons. Since mid-July, I’ve had no income. Just a few weeks before the event, I found myself homeless. I had to muster up the courage to come back from that — and the work I now do to pay the bills is seasonal, and only a third of what I once made. Thank God I paid for my airline tickets to the retreat back in March or April. Organized religion? Blah!! But this confession thing works. When I wrote my confession late Saturday night, it was as if Candy’s installation gave me permission to release my worries and leave them behind. I had made it to the retreat. I had enough money to get myself home from the airport. I told myself I’d survive no matter what. And I wasn’t going to complain about it, a deliberate practice these days. On Monday, I walked by the board with one of the staff members and happened to notice something pinned near my confession. I was stunned to tears when I saw that it was money — from three different people. Never in a million years had I expected anything from my confession. I was just happy to be at Whistler with a new attitude. I turned to the staff member and mumbled, “That’s mine.” I wept on his shoulder. I revealed my secret to another Fellow standing in front of the other confessions. “That’s mine,” I said, a bit bolder. She said she had donated because she was in the same boat. Like me, she quit her job after becoming a Fellow. She still had funds left, though, and she gave me a few dollars of what she had. Amazing! When I packed up my hotel room before I left the retreat, I decided to leave a tip from the gift of those anonymous donors. Their donations to me amounted to almost $250, so I left $25 Canadian for the person who cleaned my hotel room. The rest will provide a serious buffer during the gap until September 12, when I next get paid. This was a beautiful lesson. I learned that our community is more than generous than I ever expected. I learned that the Fellows can be the beneficiaries of each other’s projects — and that we shouldn’t forget we all continue to need help. I learned the power of a confession in such an empowered ecology. And I learned to give back, especially with what little you have, because you can. My experience at the Fellows retreat was a triumph over past insecurities and a completely empowered collaborative experience. During the retreat, I filled the shoes of a TED Fellow in my own mind — no one can take that away from me. And reading all the other confessions about feeling like a fake or a failure … well, all that’s just the noise of our humanity. Each one of us belongs. Through things like Candy’s installation, we can all see ourselves, and the world, in better light — so much clearer. Everything about this article resonates with me! Such a great piece. If you have a moment please read. I think this is wonderful. We are most human when we help other. Helping others, getting away from ego and self, is difficult and beautiful. Rather then to try to explain it I choose to be inspired by it! Been in tears for the past 20 mins. lol. The beauty of humanity. Humanity at its best! People love to help out others in need; especially if the one needing help is already trying to help him/herself! This is an inspirational story! Easy to explain… Two were fellow struggling people in the same boat that gave a few bucks and the other one was maybe a middle-upper class person that probably felt bad and could afford to give like $200 (but probably had second thoughts no doubt.) People in this system are culturally corrupted and generosity does not happen lightly in our monetary economy. We are a Culture in Decline after all. This doesn’t bring me hope for Humanity. I don’t think it matters whether the people who gave money felt bad or not. It’s important to notice that they did something about it. When we look at a whole culture, I find it difficult to depict judgements because our culture is very diverse. I also feel that we shouldn’t try to perfect our culture or society, just start with ourselves. Take in the positivity from other individuals and be a source for positivity as well! Thank you for bringing up the thought which I’m sure lingered in more than one person’s head. It’s an interesting perspective! Reblogged this on of Dreams and Deeds. Reblogged this on E4bp’s Weblog. Reblogged this on between my teeth. Life is complicated and multifaceted, and so is almost everything we experience in our human lives. Do your definitions measure up to reality? What is success to you, and how do you measure it? This TED blog post offers a subtle and moving challenge to how we look at ‘making it,’ and belonging. This is a wonderful social experiment that shows true compassion during these difficult times!